What if they forget i play on their world? I play on a server called Party Island and the owners name is BrightPain and I was just playing this server last night and I don’t know how to get in contact with the owner to re add me. Can someone help? It’s a whitelist, which means the owner has to choose that account so you can play on that world. It might only be temporary. I do that sometimes after a hacker attack while I clean up. Do you know anyone else from the server who might have access? Is it a server with a link on blockheadsfans.com? Not at all. It’s quite active. Did it ever get unwhitelisted? Just curious. Understandably upsetting. 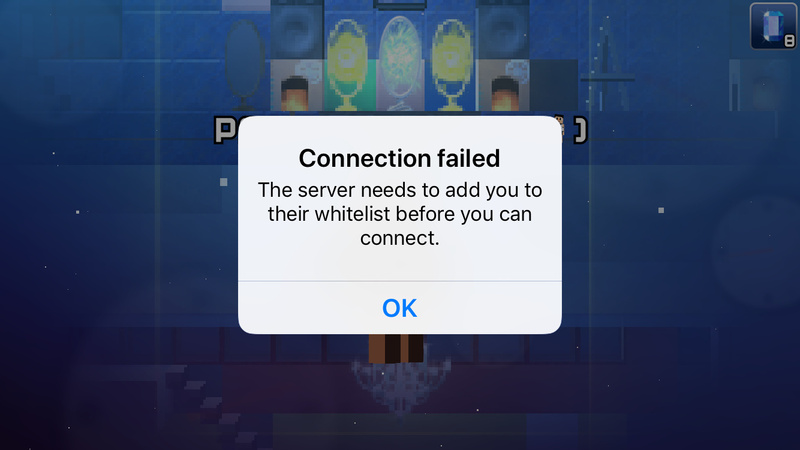 Eventually, the owner might un-whitelist his/her server and you can get back on. Perhaps, if you mention some of the players who played along side you there, someone on forums might know them. Just a thought. Yeah, that’s entirely possible. I see a lot of players who seem to hop from server to server.